You know one. You might be one: A person who just doesn’t get the whole shortbread thing. I walk a fine line there myself. I love my mom’s: she pipes it into charming wreathes with a cookie press I am far too uncoordinated to master (or too lazy to try?) 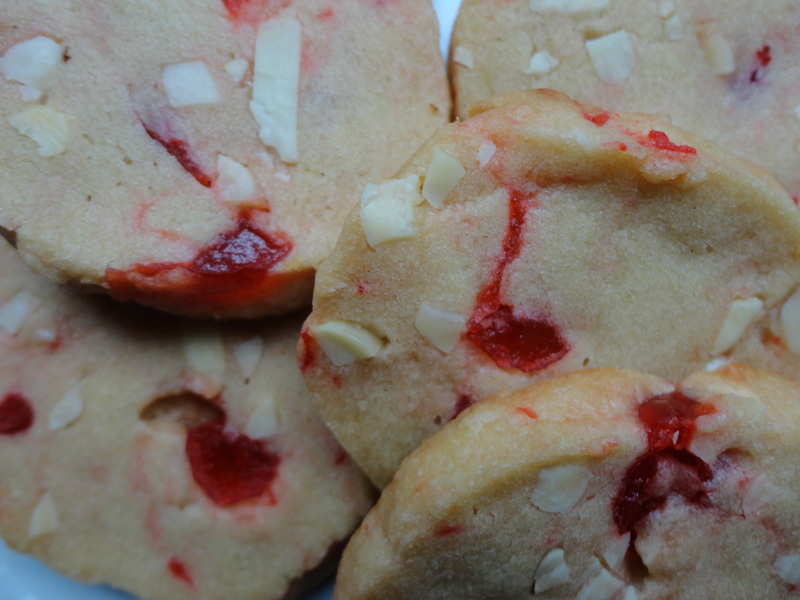 I know a few others who produce a tasty cookie, But many shortbread recipes leave me cold. Too dry, not sweet enough – sorry, I am picky. This is my family’s favourite shortbread recipe. Brown-sugar sweet, and with bits of marashino cherry adding moisture and interest. The recipe is dead easy and a little tricky all at the same time. Intrigued? The tricky bit comes in getting the cherries distributed in the dough without turning your dough pink. Then, you have to pack the dough into saran-wrapped cylinders to chill in the fridge, again without de-juicing the cherries. After that, its just slice and bake. Chopped frozen cherries get mixed in last. Having a Kitchen Aid mixer helps a lot. 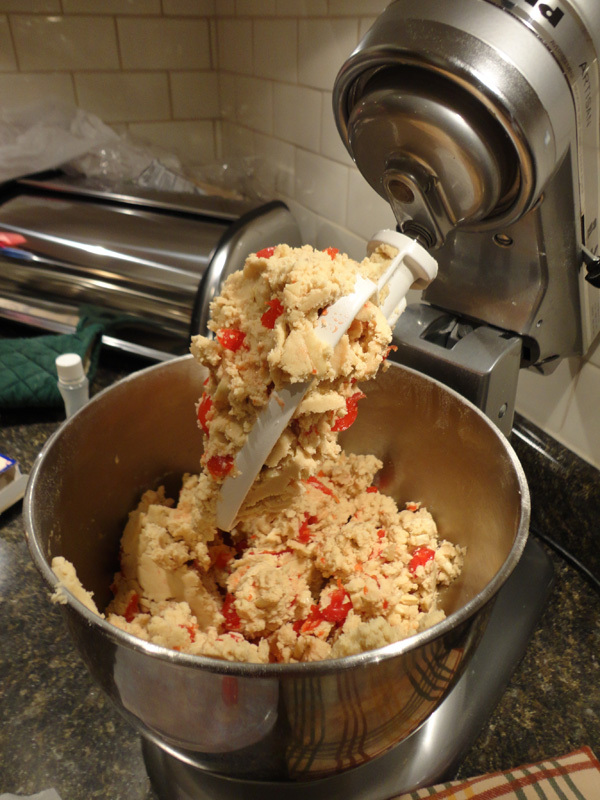 I used to make this by hand and could never get the dough sufficiently well-mixed. My strategy this year was to drain and chop my cherries, then freeze them in a single layer on a sheet of parchment. They came straight out of the freezer and into the mixer with the toasted nuts. With Saran wrap sheets waiting, those cherries were mixed in, wrapped up and into the fridge in moments, with very little pink leakage. 1/2 cup blanched silvered almonds, lightly toasted and cooled. Cream butter in mixer. Add sugar gradually, then flour gradually. A drop of almond extract would be optional at this point. Fling in the toasted nuts and chopped (frozen) marashinos. Remove half of dough to a sheet of saran, form into a fairly uniform log, pressing quite tightly, then roll up in the food wrap. On a hard surface and using hands, roll log dough back and forth a few times to make it as round as possible and compact the dough a little more. Then pop it in the fridge overnight or for up to a week. Repeat with other half of dough. When chilled, unwrap and slice with sharp knife into quarter-inch slices and place on parchment lined tray. Bake 12- 15 minutes at only 325 degrees and high in oven. Remove from oven when edges have begun to brown. Cool on sheet for a few minutes before removing to wire rack. Makes 4 dozen. Easy on your pocketbook but a bit sticky on your fillings. You've been warned. Oh dear, it has been awhile. I’ll try to make up for it, starting with this super easy and inexpensive recipe for sponge toffee. It makes a big panful for gifts or sharing. 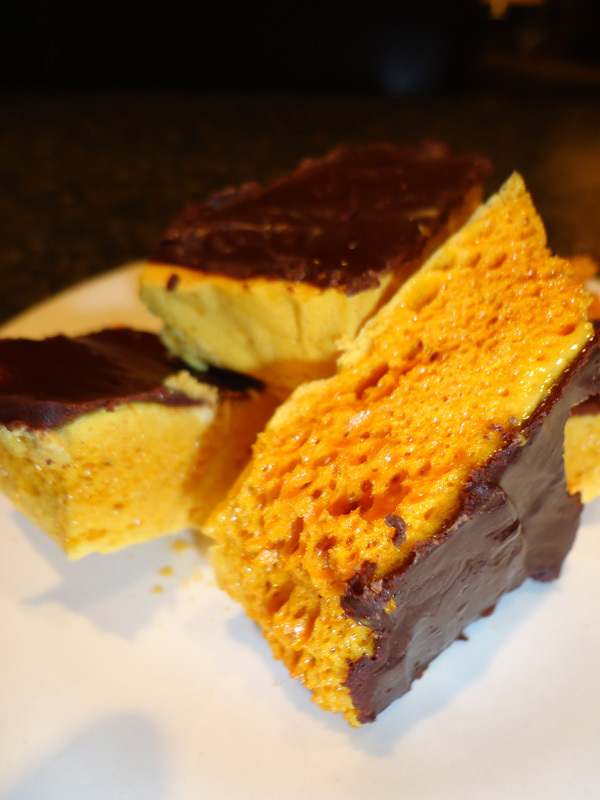 If you pine for Crunchie Bars, you will love this. It’s also variously known as sea-foam, hokey pokey and honeycomb. Line a 9×13 pan with foil and spray with cooking spray. Combine sugar, corn syrup and vinegar in a LARGE heavy bottomed pot. This is important as you will end with a lot more volume than you begin with. Cook over medium high heat until all sugar is dissolved, then bring it to a boil and cook without stirring until a candy thermometer registers 300 degrees or just a little higher. Don’t have a candy thermometer? I used my digital meat thermometer and it worked fine. You can always cook it ‘old school’ and use the cold water testing method, in which case you are aiming for the “hard crack” stage. Once there, stir in baking soda thoroughly. The mixture will foam up, at least tripling in size. Quickly scrape it into your prepared pan and allow to cool completely before removing and breaking into bite-sized pieces. If desired, melt some chocolate in a glass bowl in the microwave or in a double boiler, then dip one end of each piece, and set on wax paper or parchment to cool. Best if consumed in 48 hours or store in sealed container in cool dry place.